And on days like today, I will concede that I will be, at times, taking titles that I have reviewed before I started my 365/365 and reusing some of the content. I just linked to my Maus review above. But I’d like to think that if I am splashing an old review in here and there it’s OK for two reasons: it’s a titles that has yet to be on the 365 list, and I’m adding new thoughts onto my original post. My “American Social Situation” week has been fun. I’m not sure how many people have been keeping up, but there have been some interesting titles thus far, and today, I’d like to briefly discuss comedy in America. What’s the tie to Maus? Well, this past weekend Larry David hosted Saturday Night Live, and in his opening monologue, he made a holocaust joke. The premise was basically jumping off all of the Hollywood sexual scandals, mentioning that many of the men are Jewish, and then transitioning into the idea that there were no good pick-up lines in concentration camps. People were angry. I have to admit, as a fan of comedy, I can see why people were upset, but the joke was well written, and I can also see how people might not be offended by the joke. At times, comedy shapes our world view. I’ve seen Pete Davidson, current SNL cast member, get roasted about his father, an NYC firefighter, dying during 9/11. Pete takes it well. He seems to understand that comedy comes from tragedy. Many people deal with tragedy through comedy, and subjectivity is the basis for many an argument and outrage. I enjoy the comedy of Daniel Tosh, South Park, Bill Burr. These comedy outlets constantly push the boundaries between offensive and acceptable. I say why can’t something be both? Why did Larry David make that joke? It perfectly fit into the social situation with a tie to a taboo subject. To me, it’s a fascinating discussion. Comedy is such a strange and wonderful and upsetting thing. There is a tie here. 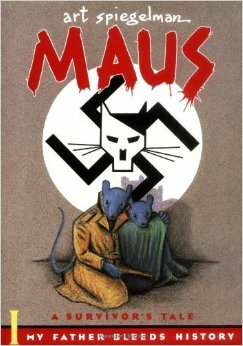 I know Maus isn’t a comedy. But the times that I’ve taught it reminds me of the gravely somber tone that is associated with the situation. Reading the graphic novel Maus with my kids was a side road of not wanting to teach Night anymore. It was an interesting alternative to reading about Nazis using babies for target practice; years of that opening weighed on me, as it should have. There are shades of somber, and many understand that we can find pathways in dealing with confusing or difficult situations. The holocaust is by no stretch of the imagination funny in any way. But are there pathways for people to find levity in it through comedy?